Judy passed from this life on December 4, 2018 at the Madison County Memorial Hospital in Winterset following a courageous battle with cancer. She will be greeted by many of her family and friends who have passed before her. Judy Ann (Wagner) James was born on June 19, 1941 to Louis Harold Wagner and Arlene Clarisse (Danielson) Wagner in Dawson, MN. She had one older brother, Eugene Wagner, and sister, Donna Wagner. Judy was married to Richard Leo James on October 15, 1960 in Madison, MN. To this union were born four daughters, Kim (Randy) Townsend of Winterset, Jody Bedell of Farmington, MN, Lisa (Scott) Politte of Waukee, and Elizabeth (Jason) White of Winterset. She also had four grandchildren, Stacie Bedell Houchins, Nicholas Bedell, Megan Townsend Stelter, and Paige White as well as eight great grandchildren, Kaitlynn, Matthew, Declan, Kael, Teagan, Brooke, Noelle, and Scarlett. She was preceded in death by her husband, parents, and brother. Judy had worked many years for the Madison County Memorial Hospital as a medical coder, retiring in 2001. She was one of the founders of The Apple Tree Players and served on the first Board of Directors for The Winterset Stage. 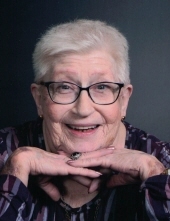 Her favorite pastime was attending her children’s and grandchildren’s sporting events. A Mass of Christian Burial with Fr. Tom Dooley officiating, will be held 10:30 AM Saturday, December 8, 2018, at St. Joseph Catholic Church in Winterset with burial in the Gregg Cemetery in Clarke County, Iowa. Visitation will be Friday from 4 PM to 7:30 PM at St. Joseph Catholic Church with a Prayer Service at 7:30 PM. Memorial contributions may be directed to EveryStep Hospice (formerly HCI Hospice). Caldwell Parrish Funeral Home - Collins Chapel in Winterset is in charge of arrangements. "Email Address" would like to share the life celebration of Judy Wagner James. Click on the "link" to go to share a favorite memory or leave a condolence message for the family.